If he gets boring, you can just kill him off. Is that why people actually like him? Information is an important commodity in any circumstances. Governments pay high prices for it. Businesses hire special people to take it apart and explain it. Sometimes, intelligence agents die for it. It’s equally important in a novel. More important, even. Think about it. As an author, you’re not really selling paper or ink or glue. You’re selling words, arranged into a work of art. Basically, you’re dealing in information. As such, you need to know when to be able to release information and when to withhold it. If you’re writing suspense, you always want to give out as little information as possible. It comes on a need-to-know basis. In fact, that’s true for every story, but more so in suspense than in other genres. You have to be secretive when writing suspense, and you have to be careful not to accidentally foreshadow something that’s going to happen, if you want your readers to not see it coming and actually be surprised. But writing any sort of fiction can be hard…. It’s hard to keep from spilling out all your nicely-planned backstory at once. But that’s exactly what you can’t afford to do. You have to let on to only a little at a time, keeping your readers interested and wondering, who are these people? what are their motives? what are their goals? until they begin to follow the story for its own sake and the sake of its enactors. Basically, you want to keep them guessing until they’re hooked. Wow, it’s been a while since I did a post about my personal life! At least, it sure feels that way, since I’ve been so busy with humor and had so many good things to say about noveling and other creative writing. Besides, I’ve been busy. And not so much with nice stuff. More with mundane stuff, like finding and keeping a job… and taking care of Raya, who recently turned four. Huzzah. Anyway, yesterday I went hiking with Iris and discovered that my family’s membership was expired (that sucked), a few weeks ago there was the Homeschool Formal Winter Ball, which was fun but noisy (I tend to prefer a lot of quiet… that’s just how I am…) And Sunday, we played a game that centered around creative writing. Basically, every time we moved on the board, we got a plot prompt, a character, an adjective, a sentence… It was like a writer’s dream come true for plot prompts (and bunnies!) Except it doesn’t really work when one is noveling… (Look up Month of the Novel. Seriously.) Anyway, so we played it. My story at the end was about dragon racing, the empire state building, and the Mafia (and a slimy Pharaoh… X-P), Jewel’s was about a talking fish and an ancient Chinese medicine man (does that even make sense…? ), and my dad told a completely HILARIOUS one about racing yachts (at least, I think it was yachts…) on a lake in the Jurassic time period, flying monkeys, a time machine (remember his secret fandom, people! :-P), a rubber band, a crystal vase (which he had to replace with a Deus Ex Machina, which was hilariously lampshaded and everyone thought was just plain awesome! ), and his mom. (She sounds more than awesome!!!) Sprite was hard pressed to think of one, until he put heads together with Dad and came up with a story about a warty stinky pirate in Scotland, the Tardis, explosions, the revolutionary war, weird footprints (you’ll know why in a second! ), the Doctor in a diving suit (I told you!!! And don’t ask me which Doctor… though I’m pretty sure it wasn’t the one played by Christopher Eccleston. ;-P), and (of course!) time travel and sonic screwdrivers! It was awesome. In fact, I think it was the Best In Show! Moving on… I was meditating on Anakin’s cowlick for no reason… well, not exactly no reason. I was just bored. 😛 Anyway… I think there used to be a joke that the reason why Anakin turned dark was because he had a cowlick and couldn’t find his part. Either that, or there should be one… What’s my point? There is one really surefire, patented quick way to create instant hate for a villain in a reader. Now, while there are no formulas in writing, there are still good ideas… and conversely, there are bad ideas. If you want instant hate, here’s the quick simple way: Have the character who must be hated be cruel or unkind to a harmless and/or helpless character, like a child, an elderly lady, or an animal that can’t defend itself. There are other ways of doing this, though, but they take time. I suppose you could go the way of hate by association, or use the opinion of a main or more-beloved character to sway that of your readers’, but this is the best way. It’s especially brilliant if the main character starts out rather pathetic and helpless, because then you can kill two birds with one stone; introduce the main conflict AND get the hate started at one time! Jude Watson does this in the Jedi Apprentice books; she has Xanatos sell a young Obi-Wan into slavery in the second book. WHILE HE IS UNCONSCIOUS. Whoa. Instant evil. Instant hate. Dave Wolverton, in the first book of the same series, introduced Bruck Chun differently; I always thought Bruck was redeemable, because instead of pulling the wings off of baby birds, the first time we saw Bruck he was engaged in a semi-serious rivalry against Obi-Wan. And Bruck Chun always struck me as ultimately redeemable. Nota bene: Bruck did not torment a “helpless” creature. We did not hate him, just disliked him. Hence, dislike and perhaps disgust, but not hate. Ultimately redeemable. But then when Jude Watson came back with the same series, later on, Bruck threatened a young Bant Eerin who was chained to the bottom of a pool and drowning. Extremely helpless. Now, we hate him. When we see Feragho the Assassin the first time, he’s just murdered the parents of two young badgers, and says “leave them to die.” Evil. The second time we see him: he chops a grasshopper in half and laughs cruelly. Despicable. Instantly hated. This is harder to do in stories in which we don’t meet the main villain until we’re in the second act of the story, but it’s still possible. An evil minion torments a helpless creature. Voila! Hatred by proxy! Now, why am I saying this? It’s simple. As authors, part of what we do is we manipulate our readers’ emotions through word choice, slight expressions, other little tricks such as using shorter words to lead up to confrontations, leaving our readers breathless. We put our own twist, our little spin, on simple, objective situations, give them objective meaning. We play around with people’s feelings, and then they thank us for it (though, to be absolutely honest, it’s kind of a love/hate relationship.) We are the masters of how the reader perceives our little worlds, and they only doubt us if we do it poorly, so it’s well worth while to do it right. Instant Boxed Hate Mix: Just Add Water. Mr. Lucas? There’s a Plot Hole Right There! Erin: I just noticed something about Revenge of the Sith. 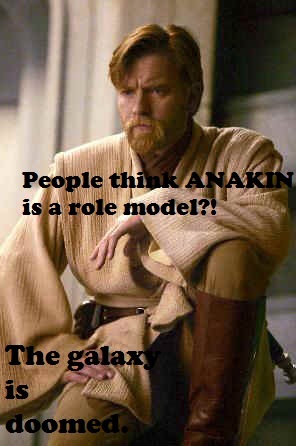 Anakin: Yeah right. She still hasn’t seen it yet. Erin: Be quiet, you! Some of us have standards, such as no graphic violence. Besides, Chosen One’s should be seen and not heard. (Obi-Wan laughs, tries to cover it up with a cough.) Anyway, I just noticed something while watching a music video. Doesn’t Obi-Wan drop his cloak on a catwalk just before confronting Grievous on Utapau? Erin: And then, when he flies off in Grievous’ starfighter, he still doesn’t have it, correct? Obi-Wan: No, I did not. Erin: But then, after you met up with Senator Organa, you suddenly had it again, to hide your identity when you were sneaking into the Jedi Temple! Gollum: Sneaking? Sneaking, it says, precious! We were only trying to get featured on her blogses, yes, precious! Erin: I only have one blog! Now be off with you, or I’ll call Sam! Gollum: We is going, yes, we is going. Nasty authorses with their inkses and pens, we never did them harm did we precious? Obi-Wan: I did not have my cloak until that scene, no. Erin: Did you sneak back to pick it up off the girder? Iris: *cheerfully walks in, ties Anakin to a chair, puts duct tape over his mouth, then notices everyone staring* What? Erin: You’re in my mind palace. Iris: And that’s surprising… why? Erin: *sigh* Never mind. Anyway… So, where did you get your cloak from in the next scene, Obi-Wan? Obi-Wan: I noticed that when I was reading the script and called it to Mr. Lucas’s attention. He said, “Well, you kind of need it… maybe you left a cloak on Bail’s ship?” I wish people would stop accusing me of negligently dropping my cloak in any odd place. Anakin makes a much bigger mess than I do. Erin: You sound like a Wookie that’s been put through a sound design program. *shrugs* So, I guess that’s that. Obi-Wan: For the record, in real life I did not leave any cloak on Bail’s ship. Anakin: *telepathy* ISN’T SOMEONE GOING TO UNTIE ME!? You’re BOTH in the wrong! *blushes* Oh, sorry, I didn’t mean you, my dear readers. And I don’t even know how it started! What? You want me to repeat that? Okay. Not even the main character can be right all the time. *glares at Obi-Wan and Qui-Gon* Nobody’s perfect… *mutters under breath* especially not you two! So, sometimes the characters must be in the wrong! You heard me. In. The. Wrong! Sorry about that. Sometimes the voices… we’ll call them in my head though they’re really in my mind palace–won’t shut up. Last night, Anakin was wandering around singing “We are never ever ever getting back together!” And I asked him if Padme had ditched him, but it turns out he was just singing the song because he liked it… ah, lovebirds. Deceptive lovebirds, but lovebirds all the same. He was singing “A Whole New World” from Aladdin to Padme as I left. Anyway, so, to recap: Don’t be afraid to have people in the wrong. Let them argue over nothing at all. Even if you’re writing a sappy, sugary, asinine little allegory, your characters will not come across as such if you let them argue and fight over nothing at all just because they’re grumpy, mad, or have low blood sugar. Have fun with the battles! Authors are all high-functioning sociopaths… they call us high-functioning because we limit our murders to fictional people. And ultimately, he turns evil and commits genocide and murders his own wife. True, he is always trying to be a hero, but he isn’t trying hard enough, and he could be trying harder. And people see him as a role model? I think not! Did I mention I like Skywalker/Kenobi friendship/partnership a lot!? Of course it is. No matter what the romance authors say. I suppose it was bound to happen; romance is being replaced. But, if you look at recent book sales, I think you’ll start to notice a trend. Think of all the literary versions of BBC’s Sherlock (which, you’ve got to admit it, for a show to be like that and go from zero to sixty in that little space, that never happens! ), like the Hunger Games. Dystopian. Divergent? Dystopian. Veggie Tales? And now I find myself caught up in the genre. I was writing a dystopian-style alternate universe Star Wars fanfic, and all of a sudden… Bam! It mutates into an original dystopian and I topple over the line between fantasy and sci-fi and land solidly (on my posterior, no less) in the dystopian fiction world. It’s happening more and more often. I mean, really, Bound to the Flame started as a crossover between Star Wars and Brave (I wanted to see what would happen if Star Wars took place in the historic Scottish Highlands, and then Merida hopped in, and for some reason Qui-Gon Jinn and Tahl were the king and queen of a small kingdom and guess what? They have a son named Obi-Wan! Who promptly goes off on his own tangent like he always does…) that gained influences from A Swiftly Tilting Planet (Rowan’s disability and the way he gained it? Blame L’Engle. It all came from Matthew Maddox. I even borrowed an Ecthros or two! Or five…), Beauty and the Beast (umm, yeah. Rowan’s not comfortable with being half-crippled, no matter what he tells you to your face. ), Tangled (minus the lock on the tower and the sheer isolation, but for some reason Margery is Flynn Rider and got herself arrested to get herself into the tower), and possibly even Frozen, though I haven’t even seen it yet!!! But anyway, about dystopian. It’s here to stay, people. It’s all about stepping up and standing out. It’s about purpose. It’s about people who really make a difference. And maybe that’s what makes it so powerful. Back again, and here we go with the next part of Bound to the Flame. No sooner had she gone than rowan turned and addressed the seemingly empty room. “Well, that was… interesting,” he laughed merrily. Fortaine materialized from the shadows. “Indeed,” he said, shaking his head. “I’m amazed that she was able to cross the wards at the border at all…” He pursed his lips. “Perhaps she possesses a latent magical talent?” Rowan shook his head. “It’s no laughing matter, Rowan,” Fortaine reproved him. “If she can pass the border wards, it’s possible that others could do the same.” Rowan sobered slightly. “I agree. If you would inform Father, please, I will speak to the Queen.” Fortaine nodded, slowly, aware that this was what had to be done, but still hesitant. “Are you sure you’ll be all right? I can sense your exhaustion, Rowan.” The younger man nodded, face set. “I’ll be fine, Fort. This concerns the safety of our people.” Fortaine nodded again and left. Grasping his staff, Rowan struggled to his feet. He limped off to the Council chamber, leaning heavily on the staff, where his mother was in conference with the elders. Arriving at the council room, Rowan drew in a deep breath and straightened his tunic and cloak. He frowned awkwardly down at his leggings, painfully aware of how informally he was dressed, but there was no time to change now. The Queen must be informed, immediately. Quickly, he grabbed the extra circlet he had hidden behind a statue for ease of speedy formal dress and centered it neatly on his head. One of the two knights on duty outside the Council chambers, Angus of Margrave, coughed, to cover up a small laugh. Rowan smiled wryly back at the man, then, drawing in a deep breath, he nodded to the two honor guards. Working together, the two knights shoved open the doors. Rowan straightened up proudly, attempting to make his leaning on the staff a little less obvious, and walked through. As a child, he had always found the massive long oaken table in the Council room somewhat intimidating, even when all the Elders were not seated there. Even now, it was hard not to enter without an involuntary shudder. But Rowan controlled his instinctive response and strode confidently forward, though he was forced to lean somewhat on the staff for support. All the Councilors rose in respect, somehow becoming still more intimidating by that small action that should have made them less so. Two young women, the representatives for two of the farthest provinces, and to whom Rowan had never been properly introduced, tittered a little at his casual garb, but otherwise, there was complete, absolute, and awe-inspiring silence. Rowan swallowed a little, bowed in return, and moved to Melilana’s side. “Mother, may I have a word with you in private?” he asked boldly. Melilana stood, pushing her high seat back. “I have to be, Mother,” Rowan gasped. “I just received a report from one of our Ranger patrols, and had to question a prisoner. Somehow, she got over the border and through our wards. I think she may have been able to unconsciously enhance her senses and to slip through the protective wards, but she had no aptitude for spells or conscious magic use. I sensed her intentions; she had no idea that she had, in fact, crossed our border, and she was only curious about us in the first place. She had no ulterior motive, so I ordered that she be returned to the border of Arethwyne and there be set at liberty.” He turned large, dark, troubled eyes to face the queen. “Have I made an error in judgement, Mother?” he asked, mistaking her contemplative silence for disapproval. It was sad, Melilana thought. He was painfully insecure, self-distrusting. She sighed. “The princess of Arethwyne,” Rowan replied. “I can see why it was a good idea to have her released,” Melilana said gravely. “We don’t want war, and according to our Rangers outside Ertraia, the other kingdoms’ mood is ready to take any excuse to attack us.” Rowan sighed. “I understand your concerns, Rowan. The weakening of the border wards would seem to point to a gathering darkness… from the inside.” She took a deep breath. “I understand that you managed to force mytar into the visible realm.” Rowan hesitated for a moment, then nodded. “I will have to discuss it with your father and my advisors,” Melilana said. “It seems that, despite our precautions, we still have not managed to entirely protect Ertraia. We may or may not call on you to give a detailed description of both events, what you saw and did. But I promise, Rowan, if the Council and my advisors do not agree with me that this is, in fact, a very serious and weighty matter, we will investigate it on our own account.” She smiled, a little self-consciously. “In the meanwhile, Rowan, please, just rest. We still have the Kingdoms’ Accord to deal with in a few weeks, and we’ll have to travel to the Cremlegged for it… This is the first time we’ll meet formally with representatives of the other kingdoms since I was a child. That alone should tell you just how important this is.” Rowan nodded, slowly. “And for goodness’ sake, please stop hanging your circlet on St. Brigid’s cloak folds. You won’t be able to get away with that when you’re king.” Rowan grinned mischievously. “When I’m king, I don’t plan on wearing one at all, except when absolutely necessary, and in the case of a threat to national security they’ll just have to excuse me.” Melilana laughed as she hugged him, pressing his face into her dress. “Silly boy.” she said fondly. “You’re just like your father.” Rowan smiled sadly, choking back a sob, hurriedly composing himself again. Melilana could see the incipient self-deprecation behind the swift, mercuric movement of his normally stoic temperament. She cupped his face in her hands. “Have I told you yet today how much I love you?” she murmured. “I probably don’t tell you nearly often enough.” Wordlessly, Rowan clung to her, and she clung to him. He, the son, needed her desperately; she, the mother, needed him, in ways both the same and different. Melilana sighed and held him closer. Some days, you just needed family to get you through. Thoughts? Criticism? As always, it’s very welcome. 🙂 Thanks for reading, and God Bless! It’s true. While much of the population can beat about the bush as far as moral dilemmas and controversies go (though it’s annoying when they do that, I’d rather be attacked ferociously by a troll than see an insipid someone who goes mmm-hmm and tries to agree with everyone on everything! ), we of the storytelling subculture must take sides on controversy and then fight our viewpoint. Why? The answer is wholly expedient… (And also advocated by Saint Paul…) In two words: Lukewarm books. No one wants to read a lurid story where no one takes a stand for what they believe in, where everyone breaks their moral codes every three seconds, where there are only shades of gray and no black and white whatsoever. Though I admit that it’s difficult to write a good story without gray shades (not without sounding preachy and being too-sweetly allegorical, which I abjure right along with Tolkien, applicability for the win! WHOO! ), it also makes no sense for people not to take sides. If people didn’t take sides, there wouldn’t be a conflict. Though in real life, people who speak out are either told to shut up or are ignored, in fiction people love ’em. Characters who take a stand are characters with charisma, characters who can be leaders. Characters who will carry away the reader with them. Second, if you’re speaking out about a controversial topic, one that “nice” (aka tepid and dissembling) people don’t mention in polite conversation, you will most likely be ignored, or blushed at and then ignored. If you’re in the right, people are likely to get angry when you impinge on their comfort zone, so if you see anger, it most likely means that either you’re being obnoxious (which is a big no-no,) or you’re doing something right. So what do the entrenched-in-error people do? They hide their anger so you can’t see that you are doing something right. Third, you don’t want to go for ad hominem attacks. An ad hominem attack is, basically, attacking someone’s character, rather than respectfully disagreeing with them. This is the worst possible way to go about changing people’s minds, which is basically what you’re trying to do. Forget about politics–this is about people you know every day! This is grassroots. Eventually it’ll get into politics. Change comes about slowly, whatever the current presidential administration may say. (Madame LaFarge makes her point well in A Tale of Two Cities. I rest my case.) So don’t attack people! (You may notice I just made a joke about the continuing goals of the Obama administration, making fun of their plans rather than them directly. This is called Republican humor, and might be taken as an ad hominem attack by oversensitive, besotted liberals… who, sadly, do actually exist… *sob*… 😛 … but it really isn’t. I just humorously disagreed with their goals and ideas, I said nothing about the administration’s actual members, themselves. It may be “off-color humor,” but you’ve got to admit, it isn’t mean humor.) Also, if you libel celebrities, it’s a surefire way to start a war, and that is NOT WHAT YOU ARE TRYING TO DO. Fourth, if people do get angry over what you’re saying, when they stalk off in a huff, call cheerily after them, “Thanks for the discussion! It was AWESOME!”, “God bless you!”, “Have a great day!” or equivalent. It confuses people, and it’s FUN. It’s called heaping coals of fire on their heads, and it changes minds. It’s also a naughty pleasure for impish Christians.